As the premier moving company in Tallahassee, North Florida and South Georgia, Mike’s Moving Tallahassee has been providing quality and affordable residential, commercial, and corporate moving services since 1993. We continue our quest to provide the best customer service and most affordable prices to our new and returning clients in Tallahassee and the North Florida Region. We are a full service Tallahassee moving company providing both local and long distance services. Our experienced crew will help you accomplish a hassle free move by carefully packing your belongings, loading the truck, and delivering your possessions to your new home or office anywhere in the continental United States or the North Florida, Tallahassee Area. Regardless of what your Tallahassee moving or packing needs are, you can be confident that you’re in good hands with our well-trained staff. To begin your process please fill out a moving quote request and one of our representatives will contact you and help you plan your relocation. Is the idea of moving everything in your home overwhelming? Are you concerned moving will break your bank? Whether you are moving down the street or to another state, Mike’s Moving Tallahassee and Mike’s Minis. has solutions to meet all your moving and packing needs at the absolute lowest prices in Tallahassee – guaranteed. Planning is a critical factor in accomplishing a successful relocation to and from Tallahassee. Mike’s Moving Tallahassee provides full relocation services at both hourly and flat rates. Our experienced staff will listen to your specific needs, and then help create a plan to efficiently pack, load, and safely deliver your possessions into your new home, hassle free. Let us help you settle comfortably in to your new home. 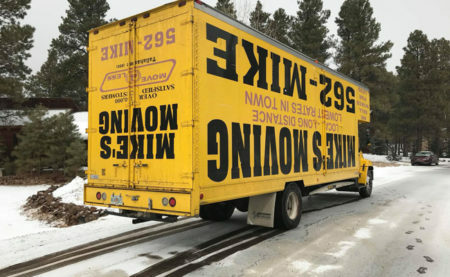 Mike’s Moving, Inc. has a large fleet of moving trucks and equipment with the experience, manpower, and expertise to get the job done with minimal disruption to your business. At Mike’s Moving, Inc. we offer a one stop service for our clients’ packing and moving needs at the lowest prices guaranteed. Relocation or expansion does not have to be a stressful experience. Call our dedicated staff today and let us help you plan a successful move.